What every pirate needs to complete his or her outfit! Make sure your mateys are decked out at your next pirate-themed bash! What every pirate needs to complete his or her outfit! Cloth, 19" square. 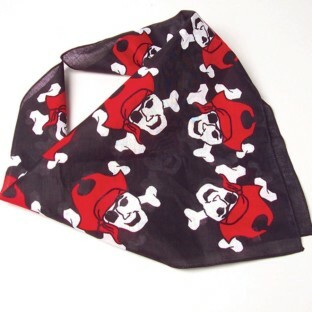 I used these for my 6-year-old's pirate party and they were fine for that and for the price they're OK but the printing on most of them was very faded--many were more gray than black. Nice size though and a fun print for kids.